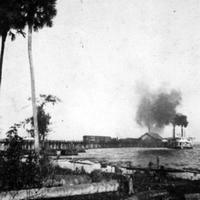 A steamship at the South Florida Railroad Company pier, which was built in 1880. The Lake Monroe and Orlando Railroad was organized in 1875. The charter planned to constructed a railroad from the St. Johns River port in Sanford south to Orlando. On October 16, 1878, the South Florida Railroad was incorporated but did not receive a charter until December 9, 1879, when it gained control over the Lake Monroe and Orlando Railroad charter. The first train on the new railroad ran between Sanford and Orlando on November 11, 1880. Henry Plant and his Plant System purchased three-fifths of the South Florida Railroad stock on May 4, 1883 and soon began laying tracks towards Tampa, whose railroad station opened on December 10, 1883. In 1893, the Savannah, Florida and Western Railway, which was also a part of the Plant System, acquired the South Florida Railroad. The Atlantic Coast Line Railroad (ACL) acquired the entire Plant System in 1902. In 1967, the ACL merged with the Seaboard Coast Line Railroad, which is now operated by CSX. By the mid-1880s, Sanford, Florida had become a major distribution center due to the city's strategic location along Lake Monroe and the St. Johns River. Even before Florida obtained statehood, steamboats frequented the St. Johns River carrying U.S. Army soldiers to Fort Mellon, located on the shores of Lake Monroe, to defend the area against Native Americans during the Seminole Wars. Steamboats were used at the fort and during the Battle of Camp Monroe to relocate Seminoles, explore the St. Johns River, and to distribute military forces. During the second half of the 1830s, steamboats were used to tow barges from the river to Lake Monroe in order to stimulate trade. The first commercial steamboat was developed as the Brock Line in the early 1850s. As trade grew, various wharves and docks were built in locations such as Mellonville Avenue, Palmetto Avenue, Oak Street, and Sanford Avenue. The Debary-Baya Merchant Line began transporting passengers in 1883, which further developed the steamboat industry. The line was purchased by the Clyde Line in 1886 and remained open until 1933. The growth of railroads was the primary cause of the decline of the steamboat industry. Original 9 x 6 inch black and white photoprint: Reference Collection, Call number RC07052, Florida Photographic Collection, State Library and Archives of Florida, Tallahassee, Florida. Reference Collection, Florida Photographic Collection, State Library and Archives of Florida, Tallahassee, Florida. Sanford Riverfront Collection, Sanford Collection, Seminole County Collection, RICHES of Central Florida. Copyright to this resource is held by the State Library and Archives of Florida, and is provided here by RICHES of Central Florida for educational purposes only. De Berard, Ella Teague. Steamboats in the Hyacinths. Daytona Beach, Fla: College Pub. Co, 1956. "Steamboats." Museum of Seminole County History, Seminole County, Florida Government. http://www.seminolecountyfl.gov/core/fileparse.php/3338/urlt/steamboats.pdf. Bass, Bob. When Steamboats Reigned in Florida. Gainesville: University Press of Florida, 2008. "Sanford: a Brief History." City of Sanford Florida. http://www.sanfordfl.gov/index.aspx?page=48. "Central Florida Railroad." Winter Garden Heritage Foundation. http://www.wghf.org/cfrailroad. "Our Evolution and History: Interactive Timeline," CSX, http://www.csx.com/index.cfm/about-csx/our-evolution-and-history/interactive-timeline/. 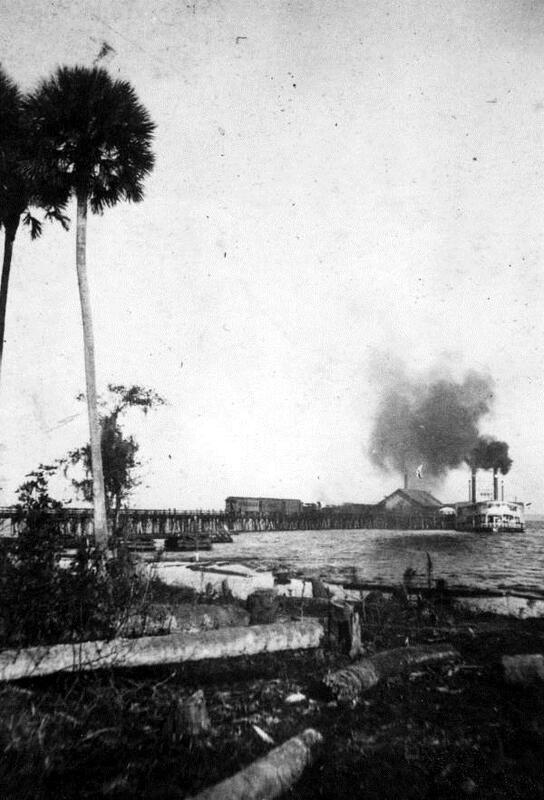 "Episode 25: The Railways of Central Florida"
"Our Evolution and History: CSX"
“Steamship at the South Florida Railroad Company Pier.” RICHES of Central Florida accessed April 24, 2019, https://richesmi.cah.ucf.edu/omeka/items/show/457.